The Theatre – St Anne’s College will present FUNK 2018 at the Hexagon Theatre in Pietermaritzburg from May 11 to 16. 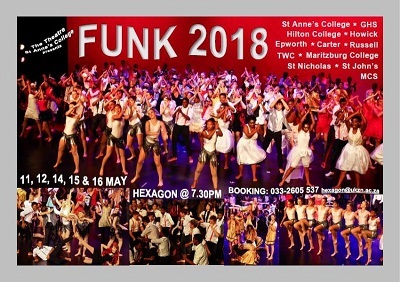 Funk 2018 is produced by The Theatre–St Anne’s College, directed by Lynn Chemaly, with the Finale by Joslyn Anderson and Anton Immelman, and technically managed by the Hexagon Theatre. Participating schools are Carter, Epworth, GHS, Hilton College, Howick High School, MCS, Maritzburg College, Russell, St Anne’s College, St John’s DSG, St Nicholas and TWC. “Funk continues to generate tremendous excitement and has been a firm favourite on the annual school production calendar now for 19 years! We are going back to our new home at the Hexagon Theatre, a specific move made the year before last to generate greater community involvement in the production,” says Chemaly. Funk evolved as an idea to create a dance programme for schools with very specific aims. Firstly, to unite schools in working towards a common goal; secondly, to give Drama students and their teachers the opportunity to create and rehearse pieces of dance theatre for public performance; thirdly, to enable young people to see that movement, dance and dance theatre is accessible to them and not only in the hands of professional adult dance companies; and finally, and perhaps most importantly of all, to generate meaning and artistic integrity through dance choreography whilst challenging young people to work outside of their comfort zones. The task for each school remains constant: to create a six-minute piece of dance choreography integrating any type of musical or textual accompaniment. The programme accommodates a range of choreographic and performance possibilities and provides the perfect opportunity for schools to experiment with new forms. Chemaly adds: “It is also important to emphasise that this platform is not a competition, and should not be seen in the same light as a sports festival or inter-house competition. The highlight of the production is always the mass group Finale which incorporates all the schools together on the stage."